Last year on Feb 6 ’10, It was the issue of payment transfers to local banks in India and Now this ‘Reserve Bank Of India Restricts PayPal Payments To Indian Merchants’ issue. It is really annoying how Entrepreneurs & Freelancers……. Anyway, lets take a look at what others are saying. According to source, PayPal’s total payment volume, the total value of transactions US$ 71 billion in year 2009 with US$191.7 million of transaction per day. Now lets write this in simple form instead of writing it with millions and billions because people hear them everyday and don’t even know how many zeros it has. $70000000000 per year & $191780821 per day *Cough* You know i said dollars! right? *Cough*. In which India did the $4.620 billion transaction per year according to 2009, that is 211,048,067,999 ruppes in 2009. Another intresting fact – Nearly 49% of the high-tech startups in silicon Valley and Washington, D.C. are owned by Indians or Indian-Americans. What Can We Do? Sign The Petition! Please Sign this Petition and share it with your friends, specially any Bloggers or Entrepreneur you know, At least Retweet or Like this to spread this. 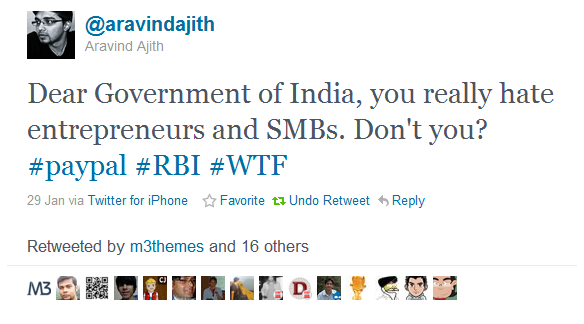 I too feel rbi is the culprit and just signed the petition. Thanks Yamha for supporting us, don’t forget to retweet and share it to spread the word. Your Petition link is displaying error : Phishing site blocked!! What is the reason? Are you sure you are using this link? What more can you expect when we have bunch of idiots ruling us. With draw money in 7 days..
some get just $1 that way you end up paying extra to PayPal. Hello…thanks for dropping by my blog and sharing the link to sign the petition to resolve this never ending issue between RBI and Paypal. I am going to sign it now. Don’t know whether it will solve the problem or not i’ve already signed the petitions and also send letters to leading News Agencies and request them to cover the issue. Please share this with your friends too. 1. If paypal keeps your money more than 7 days, they have to pay you interest and apply for a banking permit, hence the 7 day time to transfer your money. 2. If paypal allows amounts of more than $500 per transaction, they have to apply for a banking permit. In the end, it is us who are left in the middle of the road. PayPal has taken our money by way of charges but they do not want to offer any service. Signed the petition and I am not sure how much it will be effective but I think this is a good move. Also an offtopic suggestion – Your theme is broken in Chrome. Just check that out as well. Yes, i don’t know if we can make an impact or not, but we have to start from somewhere….. Yes very true and that is why I also signed it. It is almost impossible to do an online startup without Paypal. Thanks a lot for your comments and don’t forget to share this with your friends. Just signed the petition and expressed my views,hope this issue gets resolved at the earliest. Thanks for the news dude, thanks!